Howie Meeker was a legendary player, coach and CBC commentator. Recently, we discovered that he also had a hockey school and corresponding CBC show back in the 70’s! 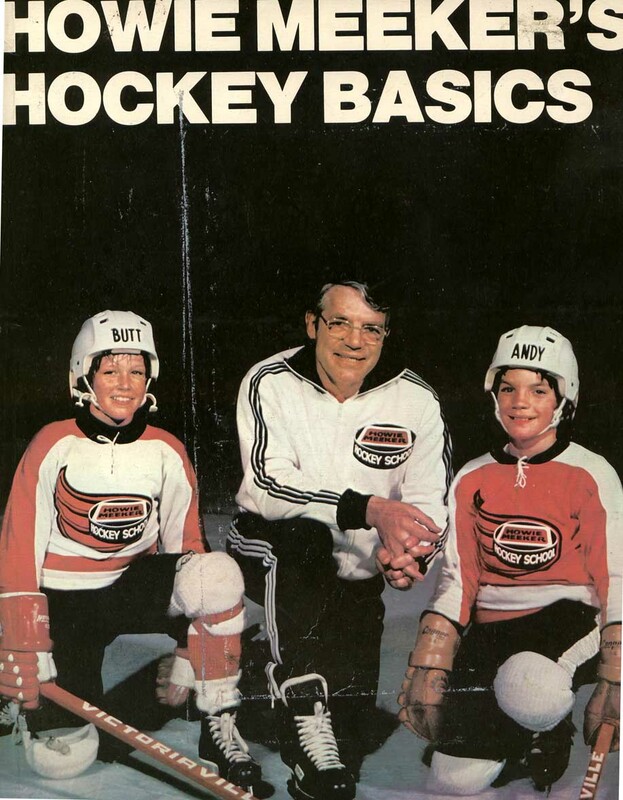 Howie Meeker sought to make teaching hockey basics to Canadian junior players the most fundamental part of all hockey training. He succeeded by putting out a book, Howie Meeker’s Hockey Basics, and he did a tv show chock-full of hockey training and skill demonstrations for a few seasons in the early 70’s. Check out this short clip of Howie talking about cutting hockey sticks to proper lengths. The whole notion of the stick length question came up recently in our own grind as one fellow player cut his stick after probably a year of us making fun of it being too long, and he scored 3 goals in the first game of using it. haha…cause & effect not concrete I know, but the stick length issue definitely needed dealing with. Anyways, back to Howie. The book, with its classic sort of sports manual/instruction book design, was so groundbreaking that even the Literary Review of Canada took notice. It was listed as one of the most important Canadian books of all time — because of its massive influence over the development of junior hockey and effect on the shape of Canadian players eventually making it to the NHL. CBC has a gold mine of archived shows that can be watched online. Start with this clip, from September 20, 1974 — just to watch the incredible intro sequence and Howie briefly reviewing what the show’s about: Howie Meeker Hockey School: A new season, new skills. An amazing piece of Canadian hockey history and a great discovery, if not just to enjoy the retro goodness, but to recall forgotten hockey basics whose timeless value can be found all these years later. Thanks to the hockeybasics YouTube channel for being arguably the inspiration for this whole article and posting up some of these awesome clips that we stumbled upon.